What follows is the result of extensive research, history, gut instincts, hope, and just plain guessing. But it may represent the most logical progression through the world's greatest competition: the World Cup. I believe that after reading this short(ish) prediction blog, you will see how this is, logically, the only way the tournament could play out (at least in my mind). And before you jump too far ahead...no, I do not have the USA winning the whole thing. But that doesn't mean I will cheer any less for those Yanks! Many would be surprised to see Mexico at the top of this group. However, this group is very deceiving. While it's true that no host nation has ever missed out on advancing from group play, there has never been THIS weak of a host nation. South Africa will be lucky to gain a point. Mexico is playing well, as of late. And they are extremely scrappy. They will bully their way to the top of the group. France will continue their recent woe of imperfection and do just enough to get by Uruguay (valiant effort) and South Africa (gracious hosts) to reach the Round of 16. Argentina are almost a shoe in to win the group. Even with their eccentric and potentially damaging coach, they have no real challenge in this opening round. Nigeria have a lot to play for as one of the African teams to make the cup. Their seeming home field advantage at every match will be more than enough to lift this team through the group and into the knock-out rounds. Greece doesn't have the same team as their shock Euro championship. They lack an offensive presence and may resort to playing for draws. And South Korea is not nearly as strong as their surprise team to run to the World Cup Semi finals in 2002. Germany are a World Cup power. They always show up and play well. They always go deep in the tournament, no matter what they look like pre-tournament. They win the group. Serbia, Australia, and Ghana are left to fight for the second place birth. My edge goes to Serbia. They seem to be coming together and playing well at just the right time. Ghana are reeling from the loss of extremely key players, and Australia looks lost on the field more than they look together. Netherlands are many people's favorites for the title. They are the most talented nation never to win the big tournament. For some reason, they always seem to fall when they should succeed. However, they will easily win this group. Cameroon represent Africa's best hope of advancement in this year's World Cup. They are talented and driven. I look for them to wrap up the second position in front of a talented Denmark squad, and a Japanese team that will look strangely out of place on the big stage. Even though they have been called old, Italy are still extremely talented. Being the defending champs doesn't hurt, either. They should top the group over Paraguay...but eventually the old legs will catch up to them. But more on that later. Paraguay will put up a regal fight for the top spot, but settling for second and a spot in the knockout rounds will suffice. Slovakia will play well, but probably won't compete with the top two, and it is very likely that New Zealand will finish as the bottom team in the entire tournament. The group of death. 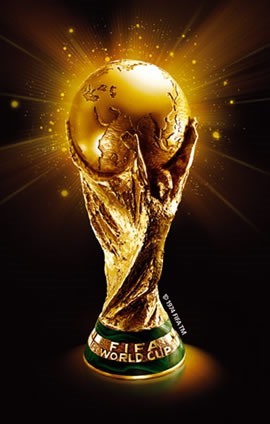 Every World Cup has one. This year, it contains three potential World Cup Champions. Brazil, the co-favorite with Spain, will have to play extremely hard, but should top the group. Following will be a two way race for second. But with the injury concerns for Ivory Coast (Drogba) and the most exciting player on the field for Portugal (Ronaldo), Portugal should prevail. The only thing that may disrupt this would be if Drogba could somehow regain fitness and show no ill effects of his surgically repaired arm. North Korea...who knows. They are extremely secretive, but have no shot, at all, of advancing. They may not even score a goal. The overwhelming favorite (co-favorite, actually) Spain will run rampant on this group. Chile looks to be in better form of the remaining three teams, with only Switzerland capable of offering up a challenge. Honduras is a Cinderella story just to make the tournament, but will have to enjoy their short two weeks in South Africa. Mexico overcomes the "home" field advantage and rolls past the Round of 16 for the first time in five World Cups. Sorry, France. You are too unorganized and lack any type of team chemistry. Argentina are too good. A good match-up. Really, it could go either way. However, I believe the USA have the heart and desire to push past a formidable foe. Remember that comment about rivalries and history? There is a lot of history between these two European powers. Some say this is a huge rivalry. But England should ride a wave of emotion (after finishing second in a group to USA!!) to easily dispatch their European peers. Not much of a match. Netherlands runs all over the Paraguayans. Upset? Sort of. But the "old" Italians fought for the first place slot in the group, and small injuries and soreness prevent them from stopping the able "home" squad. No match. Chile falls to the mighty Brazil. Their continent-mates are happy to be here, but stand no chance against the Samba Kings. It will be one of the most exciting matches of the entire tournament. Neighbors Spain and Portugal will fight until the very end, very likely going into extra time. However, the pure talent and depth of Spain will carry them through to the Quarterfinals. But if this match happens, it will be remembered for the next four years as an extremely exciting affair. Rivalry? Check. History? Check. This match has happened so much in the past few years that we already know what the most likely final score will be. USA 2, Mexico 0. There's no stopping the #2 team in the world. Not even the #3 team (Netherlands) will be able to stop the steamroller that is Brazil. Yet another disappointing exit from a major competition for the Dutch. Dispatching the defending champs may be the highlight for the Cameroonians. Spain is just too, too talented and driven. They will beat a very game Cameroon. Yes, it ends here for the USA. Sure, they took Brazil to the brink last summer. But this tournament was made for the Brazilians. They will not crash out to the Americans. Here is where it ends for Capello's squad. Spain proves too much, as Rooney loses his cool and gets the boot. Chasing the speedy and talented Spanish side will prove to be too tiring for the three lions. History? Check. Rivalry (even new)? Check. There was 1776. There was Joe Gaetjens in 1950. There was the opening round defeat at the hands of the Americans. Can they do it twice in the span of four weeks? I'm not sure. But it will be an extremely fun match to watch. Come on you Yanks!! The loss at the hands of the Americans in last summer's Confederations Cup refocused this squad, and there is nothing that can stop Spain from capturing their first ever World Cup title. Even the mighty Brazil will fall to the Spanish side who will be able to claim the two most exciting matches of the entire tournament. So there it is. Believe me or not, but that's how it HAS to happen. History, rivalries, Cinderellas, and just plain fun. It makes logical sense, right? But was it really that logical for the USA to come out of the group stages of the Confederations Cup to make the final and come within a half of the title?? Logic can be thrown out the window tomorrow. USA/Mexico, USA/England, Spain/Portugal, England/Argentina. I don't think you could have predicted more rivalries than the ultimate: Netherlands/Argentina in the finals!!! Really interesting predictions. The best predictions/justifications I've seen yet. I hope they are wrong, otherwise you just ruined the next month for me. Will keep checking back to this page.